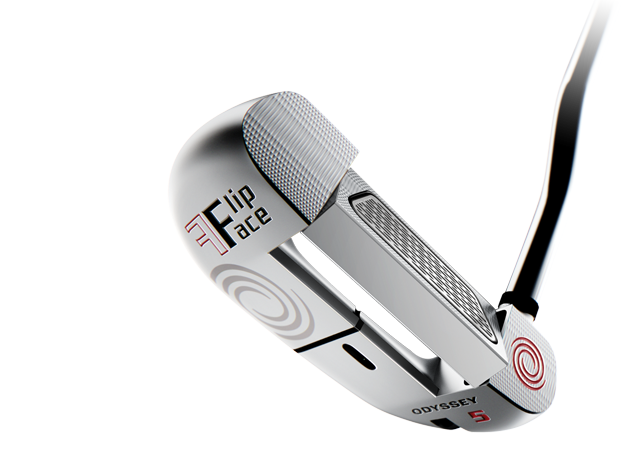 In terms of innovation, Odyssey’s new Flip Face putter is a breakthrough product. It’s a putter with interchangeable faces built into the design. No need here to install and correctly align different inserts. Rather, the Flip Face allows players, with the use of provided wrench (that’s ingeniously serves as part of a divot tool) to unscrew the face, allowing it slide open, rotate, and presto a different face. No fuss; no mistakes. The two face inserts are distinct but not radically different: an aluminum Metal X-insert versus a White Ice insert. The Metal-X insert is firmer, delivers more rebound and more friction than the slightly softer White Ice. Also, the Metal-X’s face has oval depressions designed to dampen the sound of the stroke while imparting more overspin. Michigan’s pleasant and early spring weather demonstrated a need for matching the right putter with the speed of the greens. Although courses opened early, most superintendents didn’t cut the greens daily and if they did, the grass was left longer given the fickle weather. One Saturday, I putted on greens that hadn’t been cut and were naturally very slow. Because I was using a soft-face putter, I hardly ever got the ball to the cup. The next day, I played again but used a different, firmer face putter. The positive results were immediate as I holed numerous putts. If I had the Flip Face putter the day before, I could have made a face adjustment on the putting green prior to the round and been ready for the pace of the putting surface. The Flip Face putter comes in three models: 1) a rounded heel-toe weighted blade putter with a crank-neck hosel and full-shaft offset; 2) a rounded mallet putter with a single bend shaft and full-shaft offset; and 3), a toe-weighted, heel-shafted, flanged blade putter with a long hosel and half-shaft offset. Three lengths are also offered: 33,” 34” and 35”. For what it’s worth, the PGA Tour’s Stuart Appleby has used the rounded mallet model. Each putter comes with a nifty putter cover with zippered pocket that stores the wrench-and-divot tool combo. 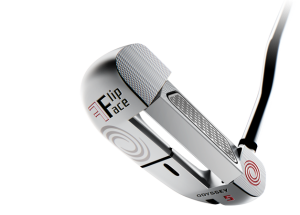 At a suggested retail price of $349, the Flip Face is, as they say in Ireland, rather “dear.” But if you need some rationalization, consider you’re getting two putters for the price of one.